To register for a class, please call the store at 631-589-4187.
for a quick way to judge the difficulty of our classes! Easy class. 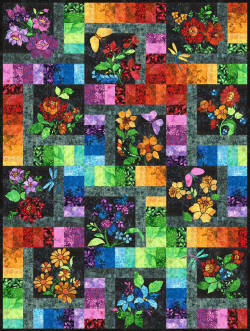 Great for beginner quilters or a fast and fun class for more experienced quilters. A class with a higher degree of difficulty. Rotary cutting experience is necessary as well as general sewing experience. Challenging! For the experienced quilter. Need a little encouragement to get started on the Enchanted Garden quilt? Come to our Open Sew and get going! Please call ahead to reserve your spot! Learn how to use your embroidery machine to create FREE STANDING LACE. 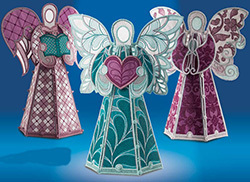 Choose from Pumpkins, Angels, or Snowmen. This hands-on class will go over all the techniques needed. Requires purchase of embroidery CD. More twin needle work making pintucks and a little reverse appliqué. Plus, a few easy blocks! What a wonderful gift for a special someone! Encourage good reading habits early and they'll stay with them for life! Easy to make. Requires pre-class preparation. Animal appliqués and embroidery on pocket available separately. Class fee includes pattern. $50 TINY TUFFETS: QUICKER AND CUTER! Tiny Tuffets: Quicker and Cuter are fast and fun little tuffets! Perfect for pin cushions or doll furniture! 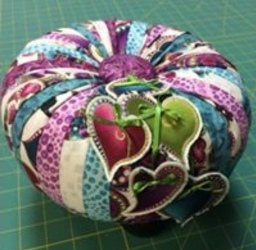 Use your 15° or 22.5° ruler to make a 7" round tuffet. Fun! Kit is available for tuffet foam and base. 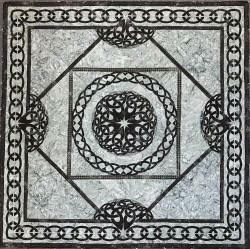 Stunning Celtic-inspired quilt design completely done in the hoop! Bring your sewing machine to put it all together! Need a little extra help or sew time for one of our class projects or block-of-the-months? We're opening up our classroom for Extra Help Friday. (Cookies gladly accepted!) Please call ahead to reserve your spot!